More power and speed than the "Personalizer". Full 18 volt transformer. 120V/AC, with fuse, 60 Hz. Compact. State of the art SCR control. Basic accessories, cord, applicator, felt pads, stencil roll, and electrolyte. Power light and AC/DC light.? Note: There is a $40.00?charge for International customers who use a voltage other than 110v. The power will be changed to the voltage of your country. Please include your voltage in the comment section of the order form.? 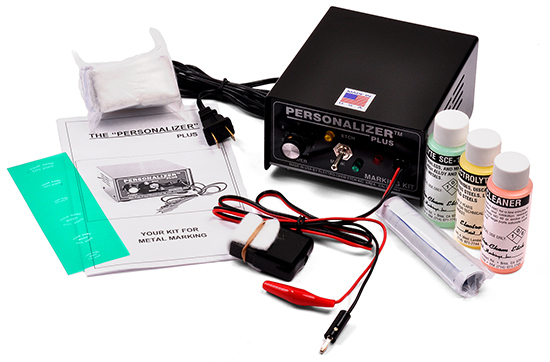 Notify me of updates to Electro Chem The "Personalizer Plus"